Before using of experts, one has to set them up first. Working parameters common for all experts are defined in the client terminal settings window. This window can be opened by the "Tools — Options" menu command or by pressing of accelerating keys of Ctrl+O. Allow automated trading — this option allows to enable or disable the performing of trade operations by Expert Advisors and scripts. If it is disabled, scripts and Expert Advisors will work, but they won't be able to trade. This limitation can be useful for testing the analytical capacity of an Expert Advisor in the real-time mode (not to be confused with testing of Expert Advisors on history data). Disable Auto Trading when the account has been changed — this option represents a protective mechanism disabling trading by Expert Advisors and scripts when the account is changed. It is useful, for example, when one changes demo account for a real one. Disable Auto Trading when the profile has been changed — a large amount of information about the current settings of all charts in the workspace is stored in profiles. Particularly, profiles contain information about Expert Advisors attached. Expert Advisors included into the profile will start working when a new tick incomes. 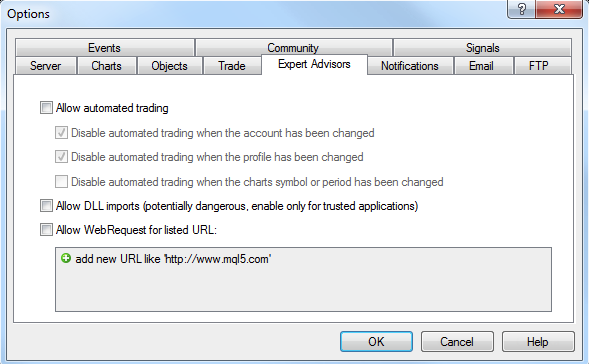 Having enabled this option, one can hinder the trading by the Expert Advisors launching when the profile has been changed. Disable Auto Trading when the charts symbol or period has been changed — if this option is enabled, then when the period or symbol of a chart is changed the expert advisor, which is attached to it, will be automatically prohibited to perform trade operations. Allow DLL importsTo enlarge their functionality, expert advisors can use DLLs (dynamic-links libraries). If it is enabled, such libraries can be used without any limitations. If this option is disabled, no expert can use external DLLs. It is recommended to disable import when working with unknown experts. Allow WebRequest for listed URLThe WebRequest() function in MQL4 is used for receiving and sending information to websites using GET and POST requests. To allow an MQL4 application to send such requests, enable this option and manually explicitly specify the URLs of trusted websites. For security reasons, the option is disabled on default.